American Dental Trading (ADT), market leader within the Benelux of supplying dental supplies, has chosen Inther Logistics Engineering B.V. to automate the existing distribution centre in Oisterwijk (NL). The outcome is a mix of storage and order picking systems that have resulted in a productivity increase of 30 percent and a decrease in the number of picking errors. 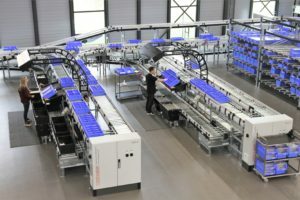 Inther has installed a shuttle system, two Goods to Man stations, two Pick to Light zones, order picking carts with Pick to Light displays and packing stations. At the packing stations, all orders collected with the order picking carts are also being stored in a consolidation buffer. All these different storage and order picking systems are controlled by the Inther LC Warehouse Management System. The whole operation has become much calmer since the new storage and order picking system went live, and stress and overtime are eliminated. Read the case study of American Dental Trading (ADT) here.